Nothing evokes a life of cubicle-bound drudgery like a white box with four differently-colored things arranged in a square on front. It’s the oddly wonderful The Stanley Parable in box form. Also inside the box. With a tie. The IndieBox subscription service takes independent PC games there’s a good chance you already own and places them in boxes with things. This evokes the experience of going to a computer store and purchasing a computer video game from the computer video game section, a thing the older PC gamers out there (like Luke Plunkett) used to do all the time. 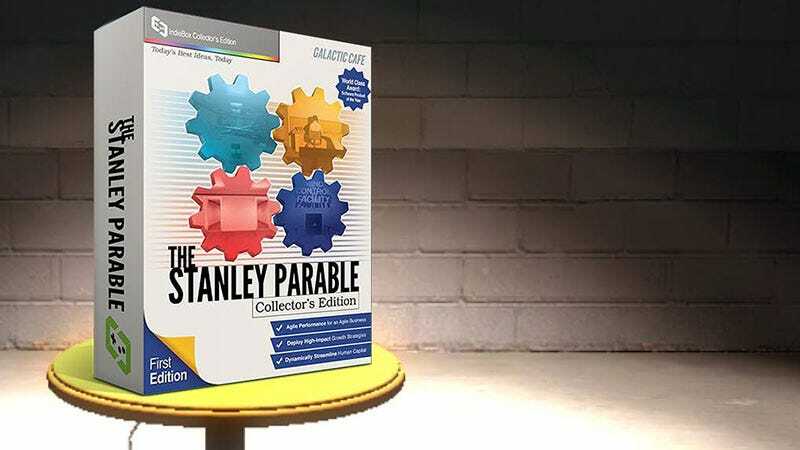 The Stanley Parable is the service’s August box, and it’s a bit of a paradox. It’s a game I would gladly purchase from a computer store, clad in a box from the section I would skip to get to the computer video games. But this is more than just the game (on a USB stick) in a box. It also has a tie inside, along with other things. So what do I do now? Do I subscribe to the service in order to get the box before the August deadline, or do I wait, and hope it becomes available for sale separately? For now I will sit at my desk, doing my work, using my four differently-colored thing arranged in a square software.